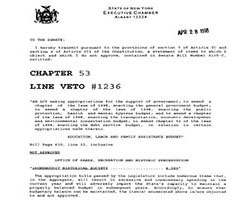 The New York State Archives has made Legislative Bill and Veto Jackets starting from 1995 available online. The jackets may be accessed by year and chapter as well as through a keyword search of the bill number and brief title. Researchers can view jackets as they are added to the system by using the keyword search option. When entire years are completed, they will be available through the browse feature as well. Researchers may download the pdf files from the Archives website at no charge. Legislative bill and veto "jackets" are files partially documenting information considered by the Governor in approving or vetoing a bill. The Counsel to the Governor compiles the jackets, which include documents relating to a bill passed by the legislature and sent to the governor for approval. Jackets are comprised mainly of memoranda and correspondence to the governor (from state agencies, legislators, legislative committees, commissions, legal associations, lobbyists, private firms, and citizens) expressing approval of or opposition to particular legislation. Until recent years, the jackets also contained a copy of the original bill and vote tallies in the Assembly and Senate. The jackets never contain internal memoranda originating in the Governors Office, nor do they contain transcripts of legislative floor debates or committee hearings. Therefore, the bill jackets provide only limited information on legislative intent and the Governors decision-making process. The New York State Archives holds jackets from 1883-previous legislative year. Only partial jackets for years 1883, 1884, 1897, and 1905 survive. Pre-1920 records are closed to research because of extreme fragility. Bills for the previous legislative year are typically available in the Archives early in the current year. The finding aid for the series provides more information. For jackets not yet transferred to the Archives, researchers should contact the Governor's office at 518-474-7182. Researchers may request copies by phoning the Archives at 518-474-8955. Due to the large volume of requests, the Archives is unable to provide expedited service via fax or e-mail. To search, Archives staff requires both the year and chapter number of the requested law (Senate or Assembly introductory number is insufficient). Researchers lacking the chapter numbers may consult McKinneys or CLS edition of the Consolidated Laws, which are available at larger public and research libraries, or at the New York State Library. When we receive the year and chapter number, staff will retrieve the jacket, count the pages, and provide an invoice number with the amount due. Prepayment is required for all orders. Local governments may submit a purchase order in place of a check or money order. See the State Archives' fee schedule for photocopy rates. The State Library also receives copies of original bill and veto jackets on microform. Researchers may contact the State Library at email refserv@nysed.gov; or call the reference desk at 518-474-5355.